The combined effect of problems related toclimate warming and the recent crisis in real estate has underlined the fragility of tourism in the Cerdagne region of southern France. Although the question of the very survival of tourism here can no longer be ignored, the possibility of its diversification, or even its restructuring, seems to be facing serious difficulties in becoming part of a public debate that is barely off the ground. La conjugaison de la crise climatique et immobilière fait ressortir la fragilité du système touristique cerdan français. Si la question même de sa pérennité ne peut plus être ignorée celle de sa diversification, à défaut de sa reconversion, semble avoir bien du mal à entrer dans un débat public qui s’amorce à peine. Summer tensions over water resources and a decline in agro-pastoral activities: landscapes on borrowed time? 1The development of tourism in Cerdagne began at the very end of the 19th century, based firstly on outside initiatives that enabled successive improvements in the area’s accessibility and development of the different aspects of its territorial potential: fresh air and sunshine, snow, high mountain hiking areas, cultural heritage and landscapes. Climate-based tourism in the first quarter of the 20th century was closely linked to the construction of the Train Jaune (Little Yellow Train) railway, running from Villefranche-de-Conflent to Mont-Louis (1910), Bourg-Madame (1911) and then La-Tour-de-Carol-Enveitg (1927), where it joined the south-west French rail network (to Toulouse) and the Spanish rail network (to Barcelona). Indeed, it was the line’s operators who were responsible for the construction of the Grand Hôtel in Font-Romeu (1914), a symbol of the resort’s early development. Following this, any further development of winter sports in the area – the first ski lift in Font-Romeu goes back to 1937, although skiing did not really develop until after the war – was related to improved road links with the Roussillon region and the Ariège valley. More recent development has resulted from the expansion of second homes, particularly those of Toulouse and Barcelona residents for whom accessibility was greatly improved with the opening of the tunnels at Cadi (1987) and Puymorens (1994). 2An overview of the resort’s rapid growth also bears witness to an early diversity in the types of tourism development in Cerdagne. Today tourism plays an economic and social role of prime importance, even though it is not the only activity. Tourism attracts visitors in both winter and summer, and to a lesser extent in the inter-season periods. There are basically three types of tourism: winter sports, focused on the four Cerdagne ski resorts that belong to a consortium known as the “Neiges Catalanes”1, rural and nature tourism, which is more scattered, takes place mostly in the summer and is based on the cultural and landscape resources of a region that includes a high rural plateau (with its landscape of pastures and small fields and hedges as well as a high mountain area above 2000 m in altitude, and residential tourism that has seen spectacular recent development. Today there are around 11,500 second homes (62% of the housing stock), forming compact patches on the plateau, in isolated blocks or on the periphery of old villages. 3The variety of possible leisure activities, like the apparent prosperity of the landscapes, would seem to suggest that the area enjoys a relatively balanced economy, making the most of multiple temporalities and a diversity of spaces. Each component of the system, however, conceals its own frailties. The risks linked to climate change in a region reputed to be one of the sunniest in France (around 3,000 hours of sunshine per year) and where snowfall has never been very abundant, do not augur well for the future of the ski resorts – despite the excellent snowfall in 2008-2009 that resulted in satisfactory visitor rates –, which have already been forced to invest heavily in snow-making equipment. Pastoral farming is still practised and makes the most of the complementary resources available: irrigated production of fodder in the lower areas and mountain summer pastures, hedged farmland in the lower basin areas and alpine pastures in the high mountains. Today, however, the balance in the farm system is being upset by urbanisation encroaching on fodder areas and calling into question the traditional systems of irrigation as the increased demand for water for new uses contributes to water shortages in the summer season, particularly in dry years. As for the urban development spawned by tourism, a source of new-found wealth for local landowning families, its impact on the landscape and environment in the vicinity of villages is far from negligible, even though the effects of the current world crisis in real estate are now being felt here particularly acutely. 4The landscapes already bear witness to some of these problems: mountain summer pastures overgrown or strewn with dwarf pines, an unlikely white ribbon of artificial snow along the ski runs at Font-Romeu contrasting sharply with the darker slope now devoid of snow, juxtaposed blocks of second homes with closed shutters, and an abandoned look about the building sites. The aim of this article is to examine these issues relating to the area’s resources and the way in which they call into question the sustainability of the Cerdagne tourism development model at a time when the relatively new Regional Natural Park of Pyrénées Catalanes (March 2004) was beginning its work in this respect. 5Apart from Font-Romeu, all the winter resorts of the French Cerdagne area were developed after 1968, the year that saw the opening of the Porté-Puymorens resort, and were the result of a variety of initiatives, with private ventures in St-Pierre-dels-Forcats (1971) and Eyne (1972), and public investment in Puigmal, created in 1975 at the instigation of the Conseil Général (departmental council). Even today, despite efforts to market a cohesive tourism product (prices, opening and closing dates) through the promotional structure of the Neiges Catalanes, the Cerdagne ski area (278 Km of downhill runs and 69 ski lifts) is still a long way from enjoying a coherent management policy, and for the moment no partnerships are envisaged with the large and only resort of the Spanish Cerdagne, la Molina-Masella (“Alp 2500” and its 121 Km of runs), despite its proximity. 6Changes in the legal status of resorts have always taken place in an uncoordinated manner, based on different approaches to managing the deficits that have punctuated their existence: public management, where local authorities accept financial responsibility: case of Saint-Pierre dels Forcats – Eyne, Puigmal and Porte-Puymorens), or private management (Font-Romeu – Pyrénées 2000). The Catalan resorts, which are relatively small compared with those of the Alps, have thus individually made plans to expand their ski areas with a view to enhancing their appeal, taking care at the same time to ensure sufficient snowfall, using either natural means (taking into account altitude and exposition) or artificial means through the installation of snow canons. Today, taking environmental impact into consideration can block new expansion, as was recently experienced in Porte Puymorens where the “Porte des Neiges” project was rejected since linking the resort’s ski area with the major Andorran resort of Envalira would have meant encroaching on a protected natural area. Opposition between supporters of the environmental and economic approaches seems to be increasingly head-on, particularly since the situation in the Cerdagne resorts (table 1), with the exception of Font-Romeu-Pyrénées 2000, is hardly encouraging in a general context of stagnating or even falling visitor rates. The drop in the number of skier-days is substantial for certain resorts, like Puigmal 2900, which are poorly equipped with snow-making facilities: -34% for the 2007-08 season in relation to the average of the previous four seasons (despite a late natural snowfall in the 2007-08 season). Font-Romeu-Pyrénées 2000, on the other hand, owes its increasing turnover to investments approved between 2003 and 2006 by Altiservice for ski lift modernisation (replacement of fixed-grip chairlifts by detachable chairlifts allowing much faster speeds) and the creation of new runs (23 million euros). A further 5 to 6 million euros was invested to replace first-generation snow-making equipment by more modern machines requiring less air. These were installed on more than three quarters of the runs and supplied at a rate of 1,500 m3/h from a new snow-making plant drawing its water from Lake Bouillouses. Coupled with the expansion of the ski area, these investments justified an increase in the average price of a day’s skiing that was greater than that in other resorts, an increase that compensated for the slight fall in the total number of skier-days. Table 1. Change in turnover and number of skier-days. 2 SNTF, Recueil d’indicateurs et analyses 2007 and Météo France, Bilan de l’hiver 2006-2007. 7Even if the 2008-09 season boosted morale, with overall turnover increasing for all the resorts thanks to an early and abundant snowfall, the economic viability of the Catalan resorts remains linked to climate risks. The Cerdagne region, with an East-West orientation and protected to the north by the Carlit massif and to the south by the Puigmal and the Sierra del Cadi, receives an annual average precipitation of only 600 mm, compared with 850 mm in Capcir and more than 1000 mm in Haute-Ariège. Apart from the more clement average temperatures, the Fohn effect (Lestir, 1979) is more marked in Cerdagne than elsewhere and responsible for rapid melting of the snow cover in winter. Added to this is the seasonal and inter-annual irregularity of snowfall (Becat et al., 1985). The increase in average temperatures linked to climate change today seems to be reflected in more frequent mild winters and/or less snow and more rapid melting of the snow cover. The pattern of the last three seasons could thus become the norm in the future (the winter of 2006-07, considered by the French National Association of telecabin operators as “an atypical season”, was the second warmest winter recorded since 19002). 8More important than the rise in temperatures observed in resorts is the fact that the heaviest snowfalls are now occurring later, toward the end of the season, which in the short term is particularly worrying whatever the inter-annual variations in overall snowfall. 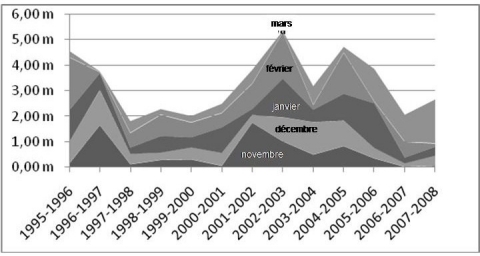 Data for the past 13 years from the Pyrenees 2000 snow-making plant confirm this increasingly late natural snowfall (Fig. 1). The lack of snow at Christmas and for the February holidays has meant that the snow-making equipment has had to operate earlier and for longer periods to ensure a minimum number of runs are open, leading to a substantial increase in the amount of water and electricity used. Even if there is abundant spring snowfall, the snow melts rapidly at that time of the year and in any case often falls after the resorts have closed. The resorts, however, are not considering staying open longer. Figure 1. Natural snowfall (cumulative totals) at the Col del Pam (1995 m). 4 The Indépendant newspaper, 17/01/09. 9Our field interviews with elected representatives and managers, however, reveal the limit and the relativity of their awareness of the impact of global warming on the sustainability of their ski areas. The difficulty of climatologists in drawing up models at the local scale has resulted in widely differing interpretations of the problem by those working in ski-related professions in the resorts. They can thus make pronouncements accepting that climate change is having an impact at the scale of the planet (and use this discourse to negotiate financial aid and credits from the Region or Europe3 for diversifying or adapting their offer) and at the same time use other arguments locally based on their personal experience or that of the older generation who point out, for example, the existence of “mini-cycles”, a theory which in fact can also be used to explain the harshness of the last winter. And, as a way of dealing with the memories of the “real winters of the past”, with their impressive snow drifts, as opposed to the present winters with little precipitation and warmer temperatures, most resort officials underline the importance of the efforts already made to adapt, particularly through the production of artificial snow. This was initially seen as complementary to natural snowfall, enabling the season to be extended to April, but in more recent years it has gradually become a substitute. The new slogan of the resort of Font-Romeu – “Snow at night, sun in the day. 500 snow canons, 300 days of sunshine (translation)”– bears witness in eloquent manner to this change in the way snow-making facilities are represented in order to satisfy, regardless of the meteorological context, the demand of a clientele that is essentially regional and cross-border. The already-mentioned indebtedness of resorts, which is sometimes colossal, results in large part from this new priority founded on the conviction, expressed by the new mayor of Font-Romeu, that “the resort that relies solely on skiing is finished, but without skiing, everything is finished (translation)”4. 10However, customer satisfaction is not necessarily guaranteed. Most skiers believe that the sensation of sliding on artificial snow is not the same as on natural snow (artificial snow is more “icy” and then becomes slushy during the day) and regret that the skiing environment is no longer “typically winter-like”5. In addition, the profitability of a tourism economy that is increasingly based on artificial snow remains to be determined, and will have to include the environmental impacts in a context of climate change where the water cycle has been upset. For although the stereotype for mountain tourism includes the presence of abundant water, this is far from the truth in Cerdagne where water management has long been water scarcity management (Broc et al., 1992). Snow-making facilities have become indispensable and in the winter low-water period exert additional pressure on available water resources. This involves ski resorts in complex water management issues where there are tensions not only between mountain dwellers and valley residents, but also between temporary neo-residents and Cerdagne farmers. 11Although, at the scale of the department, winter sports have been more important in recent years in terms of visitor nights, summer tourism, and to a lesser extent inter-seasonal tourism, continues to account for a significant proportion of visitors6, even though calculations are complicated by the role of second homes. At the scale of the Regional Natural Park, the proportion of businesses in the tourism sector, in its wider sense of the term, declaring an activity that is only seasonal is nevertheless low (around 15%). This is an old balance which is based on the area’s climatic assets, a strong territorial identity in which the Catalan language plays an essential role, the wealth and variety of historical heritage (Roman churches, Vauban fortifications, picturesque villages, the yellow train, etc. ), and overall quality of the landscapes: those of the high mountains, generally open to hiking activities, but also the farming and forest landscapes of the plateau areas below with their historical heritage and natural beauty providing an attractive route for the last section of the Little Yellow Train, today the Number 1 tourist attraction of the Languedoc-Roussillon Region7. 12The Yellow Train and its promotion from an economic as well as an identity point of view are particularly emblematic of the multi-faceted heritagization process underway in Cerdagne (Sol, 2008) and have been the subject of a candidature to become a UNESCO World Heritage site. The heritagization process, which has been closely linked with tourism development, benefited considerably from the creation of the Pyrénées Catalanes Regional Natural Park, begun in 1996 and opened in 2004. Numerous actors have been involved in this heritage project that concerns not only cultural but also historical and environmental aspects and appears to firmly position tourist activities (apart from skiing) in a process to promote sustainability. The nesting of territorial scales (inter-communalities), the complexity of the political heritage of the border area, and Cerdagne political traditions oriented more towards the atomisation of municipal strategies than to inter-municipal coherence and cooperation (Mancebo, 1999 & 2000), tend to considerably complicate implementation and often lead to significant divergence between the rhetoric used, the strategies developed and the underlying motives – in the case of town planning, for example. But the effort to combine heritagization, local identity development and tourism promotion continues and is manifest in several ways. First, several museums have been created: Musée de Cerdagne in Sainte-Léocadie, Maison de la Montagne in Eyne, Musée du Granit in Dorres. There are also extensive natural protected areas: Eyne Valley natural reserve, contiguous listed natural sites of Carlit, Lanoux, Camporells and Bouillouses8. Finally, specific management measures have been adopted at these sites to both regulate visitor flows and preserve the environment: management by the Conseil Général (Departmental Council) of the listed site of Bouillouses (with some 100,000 visitors per year) was thus primarily concerned with the installation in 2000 of a summer shuttle service (July-August) that enabled cars to be parked further away from the lake, improvements in hiking trails and public information services, and the creation of a mounted police patrol. The management plan for the listed site of Camporells, just to the north of Lake Bouillouses, was prepared under the aegis of the Regional Natural Park and the ONF (National Forestry Office) (2007-08), and focuses more on biodiversity issues and pastoral and sylvicultural activities, although its main objective also concerns visitor numbers. 13This three-fold approach involving the area’s heritage, identity and tourism thus contributes to the development of the area’s overall resources. Among these resources, the landscapes are particularly important. The Regional Natural Park is the operating structure responsible for the preparation of documents stating the objectives of Natura 2000 sites, and its charter is based on an inventory of the area’s heritage in which the landscapes have a special place. The aim of the charter is to define its objectives in the form of six landscape and urban planning charters, two of which concern Upper and Lower Cerdagne. These documents were prepared in 2007 and their implementation was one of the Park’s main operations in 2008. The focus in these documents on issues relating to urbanisation and roads seems to give the false impression of a certain “stability” in both the mountain landscapes, on condition that visitor flows are managed, and the agricultural landscapes in areas that are not directly threatened by the expansion of residential zones. 14Indeed, following a phase of marked agricultural decline that resulted in the return of heathland and forest at the bottom of steep slopes separating mountain and plateau, Cerdagne farming managed to survive by concentrating its efforts9 and adapting. One hundred farms (a decrease of 5% only between 1988 and 2000), specialising in beef cattle with the development of guaranteed quality labels10, shared a stabilised SAU (total cultivated area), combining the production of grass in the basin (mainly in natural meadows, the most productive of which are those which are irrigated) and mountain summer pastures (Mottet & Ibarra, 2002). The legal structure for the latter dates from the 1980s with the creation of numerous pastoral farm groups and pastoral land associations, which directed their efforts in the following decade toward land improvements (fences, paths, water points) and a few operations to regain control of overgrown areas, particularly within the framework of the OLAE programme11 « Maintien de la qualité paysagère et d’accueil des zones d’estives des P.O.” (Maintenance of landscape quality and capacity of mountain summer pastures in the Pyrénées Orientales department).Although the total area committed to this system (1993-96) concerned almost 60% (57,000 ha) of the mountain summer pastures in the department. measures to open up the landscape did not involve more than 5% of this area. 15Although the farm landscapes of the plateau, some of which are still hedged, contrast sharply with the mountain landscapes of the summer pastures where cattle cohabit in summer with retired working horses put out to grass, they are nevertheless seasonal complementary aspects of the same productive system. The durability of the mountain summer pastures, and even more that of the grasslands and grazing areas of the slopes, depends in part on the production of fodder on the irrigated grasslands of the valleys and the plateau, fodder which meets the livestock’s winter needs. It is thus the whole of the Cerdagne landscape that depends more or less directly on the age-old control of irrigation water, even though the two major structures, the Bouillouses dam, built between 1903 and 1910 to supply electricity to the Yellow Train line, and the EDF dam at Lanoux (1960), are industrial in nature. Fields, grasslands and grazing areas in the piedmont and basin areas are supplied by numerous collectively managed canals, some of which date back to the Middle Ages. Upstream, these canals have been more or less grafted onto the valleys of mountain torrents, while downstream they form a relatively dense network. Around 95% of some 1,600 ha of irrigated land in Lower Cerdagne are still supplied by gravity means thanks to these “regas”, despite their continued decline since the 1920s which, along with the general lack of maintenance of the secondary network, has a negative impact on overall system efficiency (Rinjonneau, 2006). 16In a context complicated by the regional and transborder aspects of water management12 (Broc, 2000) and by the foreseeable effects of climate change13, which suggest a decrease in the resource, all the studies conducted (Heiss, 2004; Vidal, 2005) have already revealed a summer deficit in dry years in several catchment basins (Carol, Vanéra, Angoustrine stream), at a time when consumption is at its highest: not very economical in terms of water, the traditional practices of gravity irrigation, supplemented by recent individual efforts (hill dams), are now being called into question because they do not always respect the compensation flow releases stipulated by law; several official reports have been drawn up on this subject in the context of the government’s Water Police (summer 2007), all reflecting the increasing social pressure on stock-breeders. 17But the necessary evolution of these types of irrigation also runs the risk of inducing profound parallel changes in the use of space by converting hay fields to simple pastures (just by abandoning them and allowing them to become overgrown), switching to more remunerative crops in the case of investment in techniques more economical in their use of water (sprinkling), or interrupting irrigation during the summer as soon as tensions appear, although the long-term consequences on the quality of fodder have still not been properly assessed. Summer mountain pastures had already suffered a net decline in the 1970-80s related to the sharp decrease in sheep herds and the concomitant fall in shepherding practices – and consequently to the end of multiple manual maintenance operations carried out by shepherds – a decline sufficiently alarming to motivate the OLAE of 1994. More recently, the gradual conversion of dairy farms to meat production, less demanding in terms of quality fodder, has also been accompanied by the transformation of the former hay fields of the piedmont area into pastures. 18Ultimately, it is therefore a whole section of the Cerdagne landscape that could change, particularly in summer. These changes would be added to the already spectacular effects of the expansion of the residential area over the last two decades, which has contributed to the increase in water consumption. The first restrictions on drinking water consumption appeared in the commune of Osséja in the summer of 2005. While drinking water for domestic consumption had generally been considered as an abundant good, practically free, the appearance of housing estates changed all that as demands on water from the pressurized urban network instead of from the old irrigation canals were made for lawns, landscaped gardens and even a few swimming pools. This is explained in part by the automation of watering procedures, incompatible with the strict rotation system and the practice of flooding, involving gravity means, rather than sprinkling. Since the drain on resources is permanent, this change compromises the balance in the water management system, much more than the direct, and in fact limited, consumption of second home residents who are often absent. 19In addition, the process of urbanisation leads to an overall devaluation of agricultural land use in relation to the increase in real estate values: above all, it is at the expense of irrigated grasslands that this urbanisation has taken place, and although a number of farming families have made a handsome profit from selling land for building14, the decline in agricultural land eventually weakens the whole system and, from the managers’ point of view, represents a major issue in the short term that must be addressed (CA 66 / PNR Pyrénées Catalanes, 2006). Insofar as the changes in land use would be accompanied by a reduction in the number of stock-rearing farms, or a change in the type of production that would result in a reduction in livestock numbers, it cannot be excluded that changes in the basin would also indirectly affect the summer mountain pastures through a possible reduction in the pressure exerted by the Cerdagne herds on grasslands. Such a reduction would not be entirely compensated for by the increase in transhumant herds from Spain and Ariege that, for the moment, is being limited by strong local resistance. The fire of 1985 in the Carol valley also served as a reminder that although this risk is generally limited in Cerdagne, it is not entirely absent in a dry year and on slopes with overgrowth. 20Here we touch on one of the paradoxes of Cerdagne tourism which is based on outdoor activities, the majority of which make use of the mountain landscape as and when they need to (hiking, free flight, etc. ): even if opportunities have been taken to set up activities that are directly remunerative – development of farm tourism, less promoted in Cerdagne than Capcir, municipal initiatives to develop hot springs (Bains de Dorres, Bains de Llo), water-games centres (Err) or via ferrata (Llo) –, the tourism sector as a whole lacks coherence, particularly in terms of marketable accommodation, which is still generally not sufficient, especially accommodation that is supposedly sustainable, such as the ecological stopover gîte of Orri de Planès. Three quarters of total tourist beds correspond to second homes, their increase representing by far the main source of income related to tourism, income that the present crisis in real estate may well significantly reduce. On the other hand, if the movement continued it could lead to a destabilisation of the agricultural system, and thus the landscape resource. 22The extent of this phenomenon and its acceleration stem from the change in French and Spanish cross-border movements and the opening up of Spain to Europe, reflected above all in the complete reversal of investment flows related to temporary residence. While at the end of the Franco era such flows were totally dominated by north European investment in Spain, the liberalisation that followed the death of Franco in 1975, then the entry of Spain into Europe in 1981, and especially the anticipation and the adoption of the euro from the middle of the 1990s, reversed the direction of property investment flows. The particular extent of the phenomenon in Cerdagne results from the proximity of Barcelona (2 hours by road after the opening of the Cadi tunnel and the building of a motorway for two thirds of this route), while the accelerated growth of the Generalitatde Catalunya (Government of Catalonia) over the past twenty years was reflected in 2005 by a GNP of €25,000/yr/inhab (not forgetting that the underground economy has the effect of underestimating the real economy by about ¼), or in other words an almost north-European level. Thus what began as a “Cerdagne” initiative, based at the beginning of the cycle on the purchase of old village houses and land by wealthy families with some affinity with the Cerdagne area, was taken over by Barcelona property development companies which sold to a wide-ranging clientele ready to invest in the French part of Cerdagne and its ski resorts. Indeed, it was the saturation of the Spanish and Andorran resorts that amplified this cross-border movement, with the diffusion of the model of the housing estate with semi-detached and terraced houses (Fig. 2). Figure 2. Osseja residential plan. 23This phase, resulting from the overflow of saturated Spanish urban areas, was facilitated by fact that the Catalan (or Castillan) language is shared by many new owners, landowners and real estate agents. This penetration phase, which was modest in the 1990s in that it complemented the older residential pattern established by people from the Languedoc region and Toulouse, saw urban areas double in size and village centres virtually refurbished. Just before the real estate crisis, the urbanisation front had progressed by 15 km from the Spanish border to Angoustrine, Llo and Saillagouse, at the limit between Upper and Lower Cerdagne. 24This remarkable growth in residential areas, which took the proportion of second homes from 55.8% in 1999 to 61.5% in the mid 2000s (table n°2), culminated in the summer of 2007 when maximum land prices were reached (€400 to €600 per m2 depending on exposition and proximity to a village centre or resort) and the average purchase price for housing units reached around €240,000 (or €2,000 to 3,000 per m2)15. This very speculative period led to residential areas becoming increasingly dense (with a higher proportion of horizontal, vertical and mixed collective housing as opposed to scattered detached houses). The year 2008 was marked by a sudden collapse of real estate prices in Spain (decline of 40 to 50 % in housing starts) and the appearance of abandoned building sites and the closure of real estate agencies in Cerdagne. The economic consequences of this change in the market, apart from the depreciation of property prices, has been seen in the decrease in visitor rates and the shrinking of that part of the economy based on residential property (Davezies, 2008) – building and public works companies, maintenance and security services – pending possible rehabilitation of a housing stock that is too large in relation to occupation rates. Table 2. Residential property in Cerdagne. 25Even before the crisis, the contrast between the impact of buildings on the landscape and the limited presence of property owners, or even their rare tenants, was striking. There is a paradox between the presence of the Spaniards, as the locals call people from Barcelona to distinguish them from French Catalan, which is often limited to the holiday periods of Christmas and the first fortnight of August (i.e. some twenty days per year) and the massive investment made both directly (purchase of second homes) and indirectly. The impact on the landscape of an architecture using mostly materials is marked. The fronts of houses have characteristic visible stonework (dark schists and grey granites at the corners), wooden beams support overhanging roofs that extend above terraces, and the whole structure has a certain unity that contrasts with the light-coloured rendering covering the farm houses, private hotels and older second homes. Wood is increasingly used instead of stone to cover the sides of buildings so that they sometimes look more like chalets with an exoticism that reflects a certain trend towards “Swissification” (Ferrier, 1998). Buildings are generally surrounded by gardens where former fields have been replaced by lawns watered by sprinklers and divided by small cement walls with a dry stone look reminiscent of the traditional “bocage” landscape. The areas of second homes appear to have paid no more than lip service to the basic principles of sustainable development, both in terms of water consumption and the use of solar energy, which is surprising given that the area’s exceptional sunshine is often used as a sales pitch by estate agents. Only the insulation, which is subject to strict standards, helps limit heat loss, although it should be pointed out that heating is electric and any journey by residents is made by car, often a large 4-wheel drive vehicle. 26Second homes in Lower Cerdagne (on either side of the border) are also guilty of not really promoting visitor use respectful of the mountain environment and its stock-breeding activities. Numerous forest and rural trails opened since the 1980s are increasingly used for mechanised leisure activities and have enabled 4X4, quads, motorbikes, and mountain bikes to venture along forest paths with restricted access and mountain pastures that are sometimes protected. In forest clearings, rural refuges situated close to trails have become degraded and even occupied by squatter campers during the summer period. These new imported uses, the antithesis of sound environmental management, come into conflict with the traditional practices of hunters, foresters and stock breeders. The multiplication of fences, ditches, prohibition notices and intimidation tags is locally transforming this natural area into a battlefield. Following in the wake of the enclosures that have accompanied real estate development there are thus restrictions on access to new forms of leisure activities (motorised or not). 27In the villages, there is the usual talk about the “Spanish invasion” and the people from Barcelona who come for the weekend with their huge “rented 4-wheel drives”. But this show of hostility, in contrast to the cliché of Cerdagne unity at the heart of “Catalanity” (Mancebo, 1997), is not only rooted in conflicts over use but also in the social impact of this residential economy: certainly the landowners of French Cerdagne – some of whom are absentees – have found it easier in recent years to sell land that has sometimes been abandoned and under joint ownership, particularly with the development of housing estates (2003-06), and local French and Spanish firms (Llivia, Puigcerda), often set up to tap into this real estate “rush”, have benefited hugely from the demand for craftsmen. But a whole section of the Cerdagne population, not concerned by land rents, and the newcomers (government employees, salaried workers...), have found themselves excluded from property ownership given that market prices, which included a mark-up corresponding to the “distinction” for Spaniards of owning property in France, reflected the buying power of the higher income groups of a metropolitan area. 28No-one can say how serious the real-estate crisis in Cerdagne will be. The sudden dip in the property and tourism markets has been felt by all in an area that was a pioneer front for Barcelona property owners. Its impact on political representatives (municipalities, departmental councillors) is not particularly visible but the fact that tourism and property activities have become less dominant should now leave room for manoeuvre for the decision-makers with regard to the reclassification of urban areas (transformation of second home areas into areas of permanent housing for seniors and the working population), the protection of agricultural land and the combat against urban sprawl when the urban planning documents are drawn up or revised. 29The territorial system in Cerdagne today appears profoundly weakened, if not in a structural crisis, following a period of property and tourism speculation. Tourism and the development of second homes have undoubtedly brought apparent wealth as well as new activities to mountain areas have helped open them up to actors other than traditional users. This has nearly always happened in ignorance of the earlier uses of mountain areas, and in particular those uses relating to water. Water has long been a source of conflict and today is as much an issue in the summer, with residential demands competing with those of traditional irrigation practices, as it is in the winter with the new requirements of snow-making facilities. This situation demands greater awareness of the “natural” limits of the new activities. The combination of two crises, one climatic and the other economic, which are being acted out on different time scales while at the same time interacting with one another, could provide the opportunity for territorial stakeholders to re-orientate discussion and action in the direction of sustainable development. This article shows that, on the evidence of current practices, this is not happening, but the rhetoric is already changing, albeit in an opportunistic manner. Given that counter-balancing powers are not absent from Cerdagne, as demonstrated by the calling into question of projects to expand the resort of Porté, it is not impossible that the decision-makers will allow themselves to be persuaded by their own arguments. Arcuset L., Bachimon P., Dérioz P., Barde C., Dalama G., 2008. – « Développement touristique durable en montagne : comment mobiliser les acteurs locaux ? ». In Tourisme durable en montagne. Entre discours et pratiques. AFNOR, pp. 99-116. Bachimon Ph., 2003. – « Indicateurs géographiques de la résidence temporaire. Demande sociale et offre disciplinaire ». In Objets et indicateurs géographiques. J. Maby dir., Actes 4, UMR-Espace, Avignon, pp. 121-132. Broc N., Brunet M., Caucanas S., Desailly B., Vigneau J.P., 2000. – De l'eau et des hommes en terre catalane. Trabucaire, INRP, 266 p.
Bataillou Ch., 2003. – « De la notion de frontière à celle de région trans-frontière ». In Les Pyrénées entre deux mondes. Presses Universitaires de Perpignan, 24 p.
Becat J., Pornisch P., Verdaguer P., Jolis A., Simo M.A., 1985. –Gran geografia Comarcal de Catalunya. El Vallespir, el Conflent, el Capcir i la Cerdanya. Fundacio Enciclopedia Catalana, 480 p.
Bourdeau Ph., 2007. – Les sports d'hiver en mutation : crise ou révolution géoculturelle ? Ed. Lavoisier, 250 p.
Chambre d’Agriculture P.O. / PNR Pyrénées Catalanes, 2006. – Etude pour la prise en compte de l’agriculture dans la charte du PNR. Perpignan, 36 p.
Davezies L., 2008. – La République et ses territoires. La circulation invisible des richesses. Seuil/La République des Idées, 112 p.
Ferrier J-P., 1998. – Le contrat géographique ou l'habitation durable des territoires. Payot, 256 p.
Heiss M., 2004. – La sécheresse dans le Bassin versant de l'Angoustrine - Caractérisation des besoins et des ressources en eau et pistes de solution. Université de la nature et de la vie, Vienne (Autriche) / Service Contrat de Rivière de la C.C. Pyrénées-Cerdagne / CA 66, 43 p.
Knafou R., Violier Ph., 1997. – « Les résidents secondaires ». Atlas de la France ; tourisme et loisirs. Paris, Reclus/La Documentation française. Lestir D., 1979. – Contribution à la connaissance climatologique des régions Cerdagne, Capcir, Andorre. Ecole Nationale de la Météorologie. frontières ». Revue de l'Economie Méridionale, vol. 48, n° 192, pp. 441-460. Mancebo F., 1997. – « Conflits, bruits et captation des flux : clés de l’organisation spatiale cerdane ». Flux – Cahiers scientifiques internationaux Réseaux et Territoires, 30, pp. 30-42. Mancebo F., 1999. – « Museus de Cerdanya : instrumentalisation d'une initiative transfrontalière de valorisation du patrimoine, Sud-Ouest Européen ». Revue Géographique des Pyrénées et du Sud-Ouest, n° 5, pp. 75-82. Mancebo F., 2000. – « En Cerdagne, des clivages qui relient, des unions qui divisent : réorganisations spatiales et actions transfrontalières en Cerdagne après l'ouverture des frontières ». Revue de l'économie méridionale, vol.48, no192, pp. 441-460. Mottet A., Ibarra O., 2002. – Analyse-diagnostic des systèmes agraires en Cerdagne française et espagnole, INA PG / CA 66. Mémoire de fin d’études de DAA « développement agricole », 55 p.
Pujol D., 2008. – Mémoire et construction identitaire : la relation entre patrimoine et identité dans les Pyrénées catalanes. Thèse de Doctorat, Perpignan. Rinjonneau C., 2006. – Etude d’adéquation besoins-ressources en eau dans la vallée transfrontalière du Carol. UPV Montpellier III (DESS Expertise des Problématiques Environnementales) / Service Contrat de Rivière de la C.C. Pyrénées-Cerdagne / CA 66, 28 p.
Sol M.P., 2007. – « La patrimonialisation comme (re)mise en tourisme. De quelques modalités dans les «Pyrénées catalanes » ». In Tourisme et patrimoine. Un moment du monde, Violier P. et Lazzarotti O. ed., Actes des journées de la Commission de Géographie du Tourisme du CNFG, « Tourisme et Patrimoine », Saumur, mai 2004, Presses de l'Université d'Angers, pp. 161-175. Vidal S., 2005. – La détermination des besoins en eau pour l'agriculture dans le bassin versant de la Vanéra. IUT Génie Biologie option environnement (Perpignan) / Service Contrat de Rivière de la C.C. Pyrénées-Cerdagne / CA 66. Viner D., 2006. – Tourism and its interactions with climate change. Ed. Travel View Publ., pp. 317-424. 1 The Neiges Catalanes also include the three downhill ski resorts (including Les Angles) and the two cross-country ski resorts of Capcir. 3 The Indépendant newspaper of 29/10/08 cites C. Blanc, Mayor of Angles and President of Neiges Catalanes, who asked the Departmental Council to set up a fund to help ski resorts in difficulty and affected by climate risks. 5 Questionnaire survey, 2007-08 season: of the 318 skiers who replied, 55% declared that they didn’t feel at ease skiing on artificial snow amid scenery devoid of snow. 7 400,000 “visitors” in 2007 (source CRCI Languedoc-Roussillon), figures, it should be pointed out, which also include a certain number of simple users of the line. 8 In total, this represents a little under 7,500 hectares, or around 14% of the total area. With the two Natura 2000 sites, “Capcir-Carlit-Campcardos” and “Puigmal-Carança”, which cross over respectively into the Capcir and the Haut-Conflent, this represents almost all the mountain sectors concerned, that is nearly two-thirds of the Cerdagne area. 9 Agreste Pyrénées Orientales, canton de Saillagouse, 2002 – Analyses et études, Agreste: la statistique agricole, Ministère de l’Agriculture / CG 66 / INSEE, 31 p.
10 “Rosée des Pyrénées”, “Bœuf et agneau Cerdagne – Capcir”, “Agneau catalan”. The planned completion of the transborder abattoir in Ur also appears to be a positive factor in this respect. 11 Opération Locale Agri-Environnementale (Local Farm and Environmental Operation). cf: Evaluation des mesures agri-environnementales en Languedoc-Roussillon – Appraisal report, December 1997 – GEYSER, IARE, DRAF LR, CRA LR, SIME, 445 p.
12 The mountains of Cerdagne are at the head of the catchment basin of the Aude, the Têt (irrigation of fruit from Conflent area) and the Spanish Sègre. The latter river is involved in complex conflictual French-Spanish exchanges of water with the Ariège basin, related to the Lanoux dam. 13 With winter snowfall amounts decreasing and lasting for shorter periods, less frequent precipitation and higher average temperatures, earlier springs and more abundant evapo-transpiration, lower aquifer recharges, and earlier and more pronounced low-water periods for the rivers. 14 Stock-breeders have often lost fields adjacent to their farms, now enclosed by peri-urban development, as well as land left vacant by absentee owners who supplied grazing land free, land that today has disappeared under real estate expansion. 15 In 2006, a studio flat sold for around €200,000 and a 2-room flat around €300,000. But the standard was a semi-detached house with 3 bedrooms, a garden shared by several houses (with a total area often less than 1,000 m²) and a garage, for a price of around €400,000. With a swimming pool or other facilities, prices could exceed €500,000. A xalet (Catalan for chalet) in its own grounds was priced at €700.000 or more. Prices can also vary according to the proximity to different facilities (Golf and town of Puigcerda, ski runs) (source: Cerdagne real estate agencies, Reclam, Panxing tot Cerdanya...).